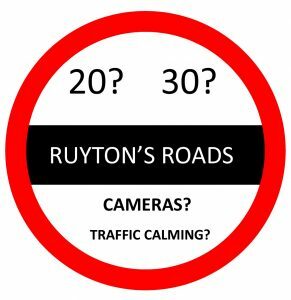 What do you think about road safety in Ruyton? Does anything need doing to improve it? Come along and share your ideas, and listen to others at a public meeting in November. Everyone in the community will have the opportunity to look at the suggestions being put forward by the Safer Roads Group and to put forward their own ideas. The Safer Roads Group was formed by the Parish Council and includes Councillors and members from the community. They are actively looking at ways of making the village safer. One of the possible improvements is the use of ‘build outs’ and/or marked parking areas to reduce the width of the road at key points and help to reduce traffic speed. If you like this idea then have a go at specifying a location using this online tool. The meeting will take place at 2pm on Saturday 24 November at St John’s Primary School. Everybody is welcome – the event will be child-friendly. Do not drive or park on pavements because this forces pedestrians and child cyclists into the road and obscures views along the road. Instead park on the road because this will have the effect of slowing traffic down.